US customers. We ship USPS with tracking. Please select media mail or priority mail. International customers. If you don't find your location in the shipping list then contact us. Please don't push randomly "by now" buttons - thanks. We always look for the cheapest shipping option. More resources in the customer corner. Password comes with the book. Glossary, list of links, power point, excel files. 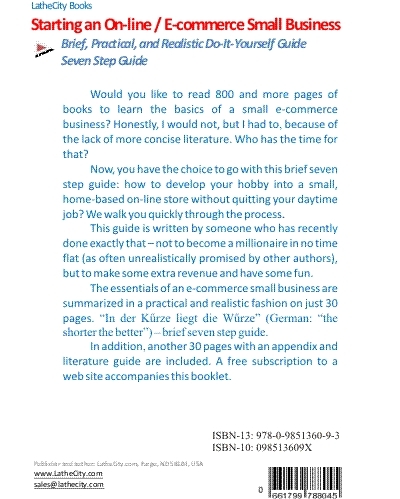 Synopsis: Would you like to read 800 and more pages of books to learn the basics of a small e-commerce business? Honestly, I would not, but I had to, because of the lack of more concise literature. Who has the time for that? Now, you have the choice to go with this brief seven step guide: how to develop your hobby into a small, home-based on-line store without quitting your daytime job? We walk you quickly through the process. This guide is written by someone who has recently done exactly that – not to become a millionaire in no time flat (as often unrealistically promised by other authors), but to make some extra revenue and have some fun. 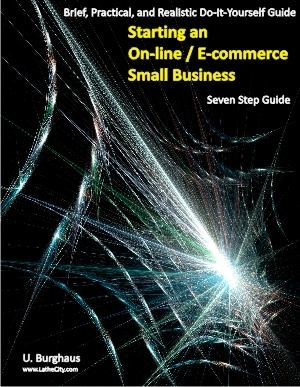 The essentials of an e-commerce small business are summarized in a practical and realistic fashion on just ~30 pages. “In der Kűrze liegt die Wűrze” (German: “the shorter the better”) – brief seven step guide. In addition, another ~30 pages with an appendix and literature guide are included. A free subscription to a web site accompanies this booklet.